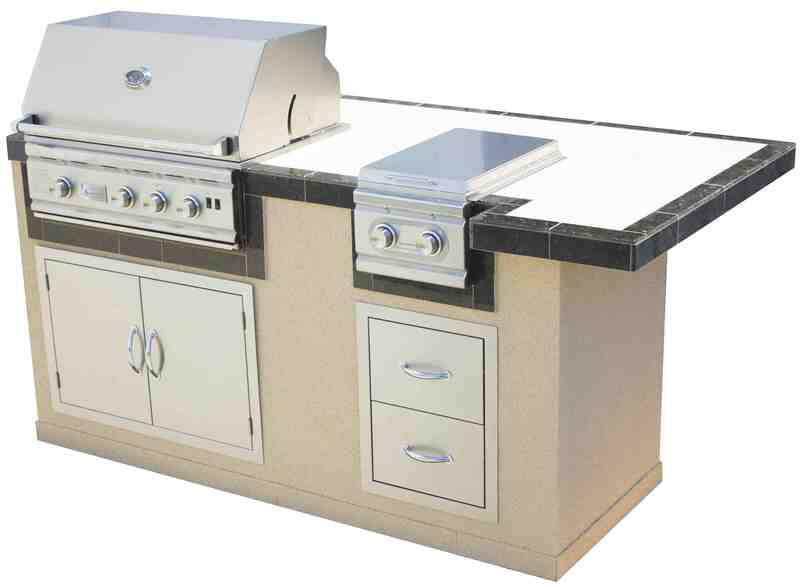 The Oahu Island by Summerset™ Professional Grills. Almost two decades of experience is paying off for designers at Summerset™ Professional Grills, a company that is increasingly taking on the leadership mantle in manufacturing and branding. Grills, BBQ Islands, and Fire Pits are made with exceptional build quality, amazing value, and personal service. Available in finished, unﬁnished, and partially finished, customers will enjoy creating new memories and exciting conversations with family and friends thanks to Summerset Professional. Summerset Islands and Fire Pits come standard with rust resistant 1-inch by 1-inch .60 gauge mig-welded steel construction frames, trex railing system, stucco, and porcelain tiles. Dealers/customers may upgrade to Ameristone to replace the stucco, and granite to replace the porcelain tile. Islands include complete electrical system. Fire Pits include installation lines, fire glass, and a 14-inch x 20-inch stainless steel access door—and high quality #304 stainless steel burners that push out up to 140,000 BTUs. A 14-inch by 20-inch stainless steel access door, and high quality #304 stainless steel burners push out up to 140,000 BTUs.